365-Day 100% Money-Back Guarantee: This is a 100% money back guarantee. No questions asked. If for any reason you’re not satisfied with your Patriot Power Generator, just return it within 365 days of purchase and I’ll refund 100% of your purchase. Q: What is the Patriot Power Generator 1500? A: The Patriot Power Generator 1500 is a portable solar generator that will provide electricity to a variety of critical devices and equipment in the event of a power outage. The Patriot Power Generator 1500 contains a lithium-iron- phosphate battery that is rated for 2,000+ life cycles and holds a charge for up to 12 months with a minimum charge retention of 80%. (We recommend that you charge it every six months for optimal performance). It is much quieter than a gas/diesel generator and has no emissions. The Patriot Power Generator 1500 is portable and small enough to take virtually anywhere. Q: What is included with my Patriot Power Generator? A: Your new Patriot Power Generator 1500 will come with the generator unit, a 100-watt foldable solar panel to charge your unit and a 25-foot extension cord for ease of placing the solar panel outside while the generator is inside. It also comes with a multitude of bonus items including a Survival Essentials Kit (72-hour emergency food supply, 11-in-1 survival tool and a Survival Spring for purifying water), a deck of playing cards listing 52 ways to Save Power, and four hard-copy reports titled, The Three Hidden Dangers of the Smart Grid, The Top 7 Reasons the Power Grid Will Fail, Your Complete Survival Checklist, and The Blackout Response Guide. The Patriot Power Generator ships FREE to anywhere in the contiguous 48 states. Q: What can I run on my Patriot Power Generator? Power your 5 cubic foot freezer indefinitely, so you can have a long-lasting supply of food that’s safe to eat. Not to mention, use it to power your slow cooker, toaster oven or even your coffee maker. Recharge your cell phones, computers, tablets and radios so you can communicate with friends and family and stay informed. Power critical home medical devices, such as portable oxygen equipment, infusion pumps, CPAP machines, mobility devices or monitoring equipment. Q: How long will my Patriot Power Generator keep me protected? A: The generator will last for 2,000+ life cycles and will retain its charge for up to 12 months with a minimum charge retention of 80%. We recommend you charge the unit every six months for optimum performance. 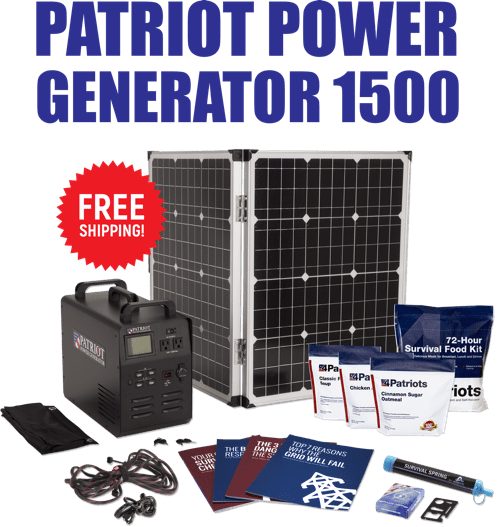 Your Patriot Power Generator 1500 and bonus items will come to you from our USA-based warehouse and we expect them to reach your door within 10-14 business days of you placing your order. Please note that your order will consist of multiple boxes with varying weight and shipping requirements and may arrive on different days. Your generator will be delivered via UPS Ground with a signature required at the time of delivery. A: We are unable to guarantee today’s pricing beyond today. Our pricing frequently changes due to the constantly changing shipping regulations and government red tape. Also, with recent disasters such as Hurricane Sandy, owning a personal generator is increasingly popular which may result in decreased supply throughout the market. To guarantee our lowest pricing, be sure to secure your order today. A: While we feel that the Patriot Power Generator is the top-rated product in the industry, if for any reason at all you are dissatisfied just let us know within 365 days and we will arrange for you to return it for a 100% refund. LEGAL DISCLAIMER: All testimonials in this advertisement are from real people; sometimes name and picture has been changed to protect their privacy and some were given free products in exchange for their honest feedback. Testimonials represent exceptional results, don't apply to the average purchaser and are not intended to guarantee that any one will achieve the same results. The organizations and publications referenced on this site are not affiliated with and have not endorsed, sponsored or recommended this product. Cade Courtley is a former Navy SEAL and Platoon Commander who served 9 years of active duty and has been compensated by 4Patriots for his hard work in helping us test and endorse this product.